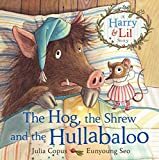 If this gem of a book from poet Julia Copus and illustrator Eunnyoung Seo is anything to go by, there is another partnership to rival Donaldson & Scheffler. They work with equal skill and apparent consummate ease to produce truly wonderful, memorable picture books. One hates to make comparisons so maybe drawing a parallel is preferable here. 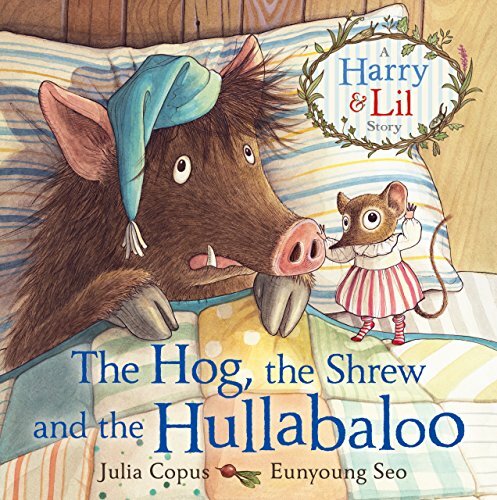 This is the second story to feature hog, Harry, and his best friend Lil, a shrew. Harry is fast asleep when he is awoken by a strange sound outside his window – a scratch-scrump-crunch-skiffle-skreeeee-kazoo no less. A frightened Harry calls up Candy Stripe Lil who, being such a good pal, rushes straight to his aid. There’s a taster of the lyrical language employed by the author. Then comes a third sound, a “Kraaak!” this time, but it proves to be merely Frog serenading his true love, not the fierce creature of Harry’s hearing. Just as morning light comes over the hill, all is finally revealed and then it’s time at last for a well-earned sleep for Harry (‘ZZZ’) and Lil – well maybe not for Lil. The soft, subtle colours and the shades of twilight and moonlight of Seo’s illustrations give an added air of mystery to the tale without spilling over into true scariness.